As some of you may know, we had a last generation Sonata in our fleet for a while. 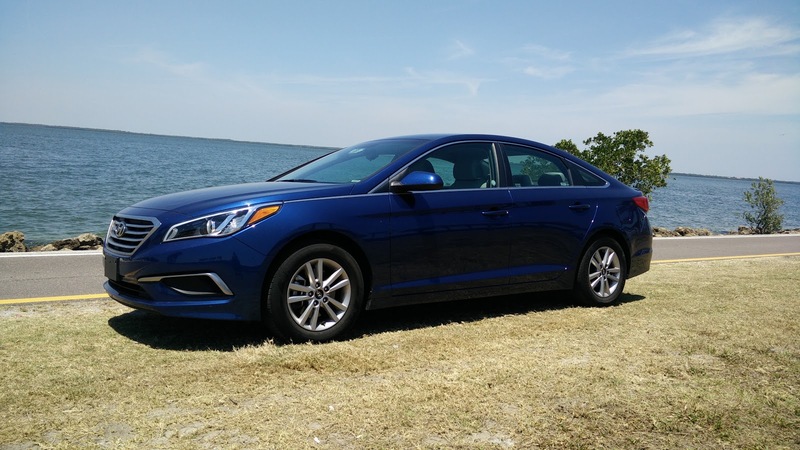 I really rather liked that car's overall design and the fact that the Limited trim level came with nice-looking 18-inch wheels. 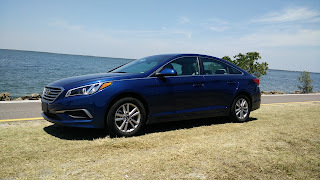 This latest iteration of the Sonata, however, tries to borrow from a new design direction that Hyundai has taken and I am not fully convinced it is a better look. At the very least, it is a more grown-up design, but is much more anonymous compared with the prior generation. Sure it bear what appears to be a signature look, but the side profile and the design of the tail lights is reminiscent of other brands while the wheels look like they were the most boring option that anyone could be bothered to come up with. Design aside, getting into the interior was certainly much more pleasant. 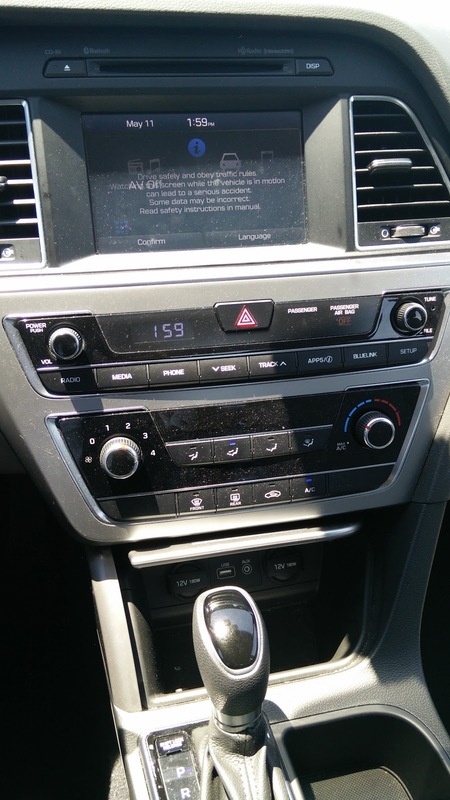 Even with a pretty basic cloth interior, the Sonata's interior is a reasonably comfortable place to be. The piano black accents are used liberally around the center console and lend the cabin a slightly more upscale look while the simple instrument cluster is easy to read and intuitive to use. Seats are modestly adjustable and have a good shape to them, making them relatively comfortable for a long drive, though a bit lacking in lumbar support. The tactile feel of most of the materials was good, but not great, with a reasonable amount of soft touch material above the knees, but just about everything blow the knees was hard molded plastic, typical of this class. Nothing stood out as being particularly offensive or abrasive and everything fell to hand easily enough, a godsend in a rental car. Of course, the focal point of the interior is the touchscreen infotainment system, which thankfully included Android Auto integration. 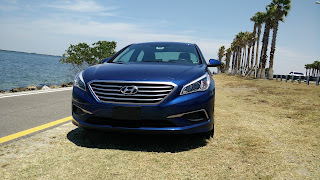 I basically skipped using Hyundai's infotainment experience altogether and instead allowed myself to rely on having my phone power the experience the whole trip, which would be a stark contrast to what I would be able to do on the next leg of my trip. That touchscreen is simple and quick to react and once Android Auto boots and loads, makes the entire driving experience that much better. 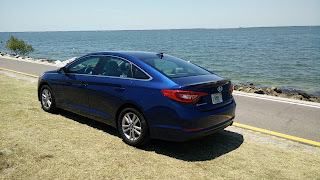 Being able to quickly see all of my relevant information for destinations and not have to worry about missing work related messages is a huge benefit, one I cannot stress enough with rental car companies. If I have a choice of a car with Android Auto versus one that does not, I will always take the one that has the option. 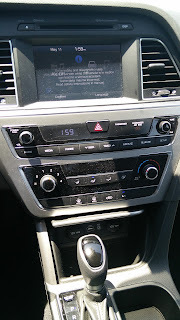 Unfortunately, the infotainment is pretty much to highlight of this car. Using a switchblade key, I fire up the bland sounding 2.4L four-cylinder motor and turn the over-boosted power steering to guide my car out onto the highway. This motor is pretty much the definition of beige, making adequate power and tied to a transmission that handles shifts with total adequacy. In some ways, it is the perfect car for most sheeple, while are just interested in an appliance to get from A to B. Nothing about the drive of this car stood out as being particularly good or bad. In fact, it is totally forgettable, which is probably what most buyers want. 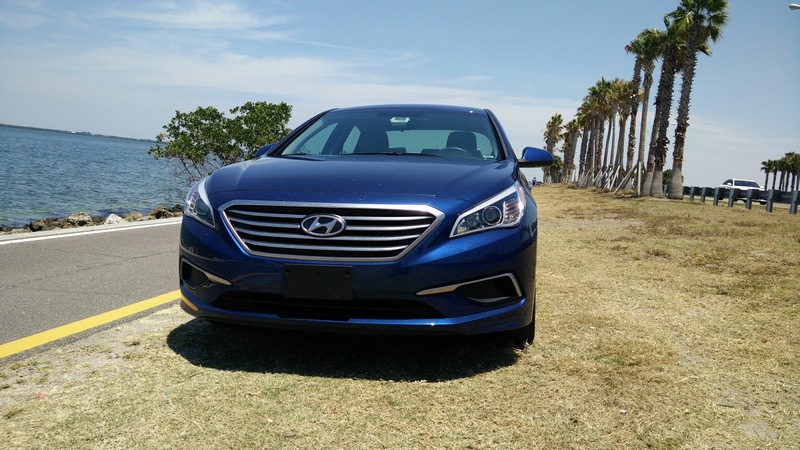 Forget the Toyota Camry, if you want the automotive equivalent of boring, this Sonata fits the bill perfectly. I spent the next two hours on the roads of central Florida, making my way across the width of the peninsula, fighting the boredom to stay awake as I traversed what had to be the most boring landscape in the world. About the only thing keeping me awake was the desire to avoid toll roads to the best of my abilities, which the state of Florida's highway system seems to think should be a game as it is far too easy to find oneself inadvertently coming upon a toll booth with barely any notice that the road is converting to a toll road. At the very least, the Hyundai's A/C seemed up to the task of fighting Florida's obscene heat and humidity and kept me fairly comfortable, although would it kill them to include auto climate control at this level? After a couple hundred miles with this car over two days, I left without a significant impression good or bad. 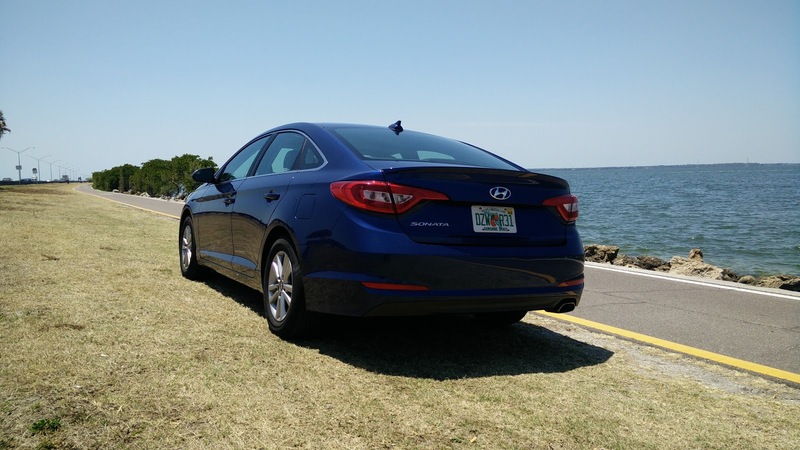 It was a reasonably quiet, reasonably comfortable, but otherwise completely forgettable drive. For a rental car, that is not a bad thing. But for a daily driver, that is probably precisely the reason why people spend all their time staring at their phones. 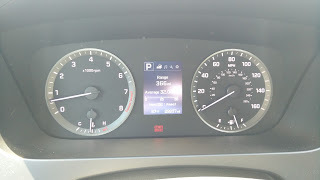 It has become too easy to become disconnected from the world, even when behind the wheel and when cars have gotten so forgettable that driving them places most people on auto-pilot, it is no surprise that people have stopped caring about driving dynamics and put a greater emphasis on other things. And even so, I did not find this car the least bit offensive, which is more than I can say for any Nissan product I have driven in recent memory.